David, my son, Michael and I were picked up by EJ in a big Cadillac, and driven to the hall. After a brief sound check, we retreated to the green room to eat dinner and schmooze with friends. Our publicist, Amanda Sweet made her way to visit, along with her friend Michelle Pendoley from the Washington Opera. 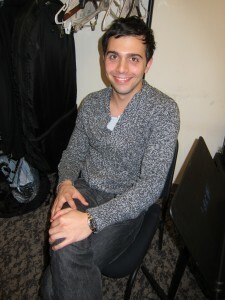 Also hanging out in the green room was Michael Fox from our agency, Baylin Artists Management. Michael is a classical bass player, and a wonderful friend to the quartet. I had a good talk with him about a range of topics which was not limited to but included playing Mozart on the bass, the joys of touring the Midwest, losing weight through working out, and of course, the joy of the booking business. We’ll be seeing Michael again in January when the quartet performs in a showcase with jazz singer Tierney Sutton. The general manager of the Alexandria Symphony, Adrien Finlay had again shopped at Whole Foods, so we dined on delicious salmon with mango chutney, chicken, steamed veggies and a fruit and cheese platter. Dave and I cleared out the green room so he and I could dress and warm up. It was beginning to heat up, and I was beginning to get a bit nervous. Do you think there was a connection? David began the concert with his concertino, Little Mouse Jumps. David has played this piece before, but there’s still nothing quite like performing with a symphony orchestra. I found this out minutes later when I made my way out to the stage, gingerly weaving through the first violins to ascend the cello podium. 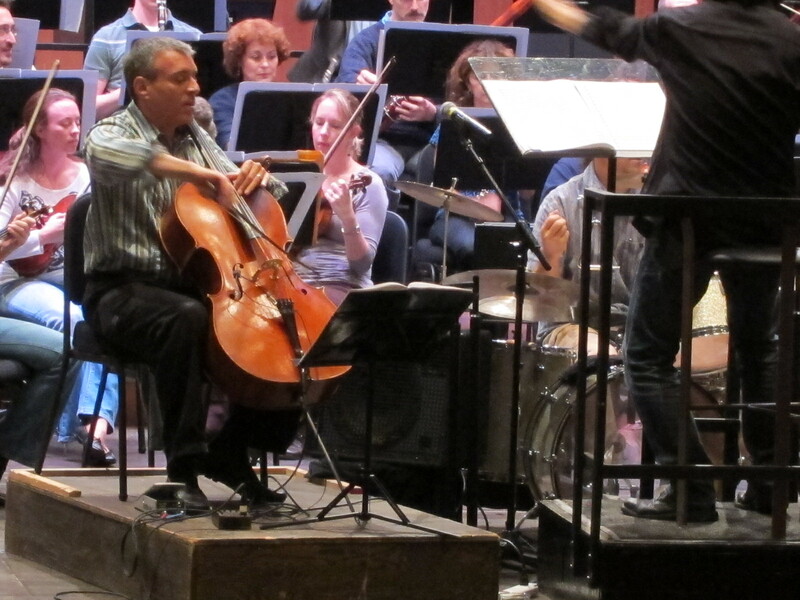 I generally try not to use cello risers; they aren’t long or wide enough for me. However, I was determined to make the best of it. After getting settled into my chair, and plugging in my pickup and microphone, I waited for the conductor to raise his baton, signaling one of the percussionists to play a flam bringing me in. In seconds I was experiencing the thrill of “dancing with the elephant” as I call soloing with an orchestra. There were times when the rhythm was quite suspect, and I had to concentrate profusely to not make a mess of David’s piece. I thought I did quite well, although there was room for improvement. The performance on Sunday afternoon was considerably improved, with tempi more nearly matching those we had worked out in rehearsal. After both performances, David and I went to the lobby and signed Cds. We find that it drastically improves sales, and gives us a chance to connect with the audience in a meaningful way. We are always thrilled to meet young people; several audience members mentioned that they had heard us years ago at their elementary schools. A mother introduced her cello playing son, and asked me to encourage him to continue studying. These interactions are meaningful and fulfilling to me. More to follow!